Nebula TC Vape Kit comes from Vaporesso family with decent size easy to drip, which integrates Nebula Box MOD 100W huge power and Veco Plus tank 2ml capacity, featured with 0.69 OLED distinct screen,which can remind you of temperature, battery and voltage. Hers is one of the most popular TC kit in Vaporesso family, Nebula TC Vape Kit with decent size easy to drip, which integrates Nebula Box MOD 100W huge power and Veco Plus tank 2ml capacity, 2ml e-juice tank has enough capacity for vaping long time. The Nebula kit is featured with 0.69 OLED distinct screen,which can remind you of temperature, battery and voltage. 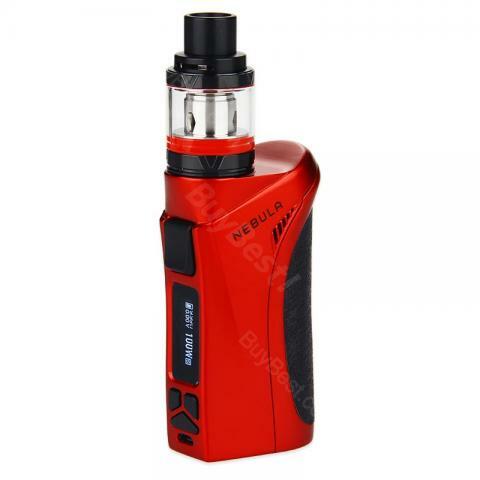 Powered by standard 26650 or 18650 battery, Nebula can arrive 100W huge output, the temperature control device can control the temperature from 100℃ to 315℃, which can allow you adjust the flavor what you like. Casted by zinc alloy and Al alloy, the kit will prevent scratch. Your feeling of Nebula TC Vape Kit is absolutely fine workmanship, unique style. • 3 months Warranty for Nebula MOD. • It can work with most 510 threaded clearomizers/tanks. • It doesn't come with 26650 battery or 18650 battery, you need to buy the battery separately. • The replacement colils are Traditional EUC (0.4/0.5ohm) and Ceramic EUC (0.5ohm SS316). excellent. fast delivery, good communication with seller. Thanks. Nice product, which works perfect, no regret about this product. It is as it advertised. I love it! arrived, haven't used it though, I guess I would get my hands on it later on. I would rate it a+, all good so far, im very lucky that I found buybest!